Buy personalisable Bookmarks from RM35 using Photobook coupon! Buy customisable Wedding Invitations on Photobook Worldwide with Discounts and receive Cashback! Planning a wedding? How about customizing your wedding invitations on Photobook Worldwide! Get 5 or More Photobook items to Get 85% off + Shipping Waived with Discount voucher! Buy your own customisable clock for as low as RM129 with Photobook Worldwide Voucher! Photobook Worldwide Deal: Get a Free "6 x 6" Simple-Book When You subscribe for Newsletter! Fully cpersonalised Notebooks on Photobook Worldwide from RM79 Only with coupon! Documenting your best moments no longer needs to empty your wallet as Photobook Worldwide offer several coupon codes and deals to customers through the year. Click on the Promotion tab in the header section of the website and get access to the best deals and coupons to save your money. Along with a photobook coupon, you can also find offers on gifts like photo puzzles, tumblers, mugs, softcover albums and a lot more. Special occasions offer a host of unique gift ideas to make your loved ones feel treasured such as a Valentine’s Day special gift line, Christmas surprises and many more. Be sure to return to this section often to stay updated on the latest deals and offers. Along with an extensive product range, customers in Malaysia can also enjoy amazing offers and additional cashback when they shop via ShopBack. You can also follow them on Facebook, Twitter and/or Instagram to stay updated on latest offers and deals. Be sure to also check out sites such as AliExpress and eBay for similar services on ShopBack. Some of the best deals for Photobook Worldwide on ShopBack have been detailed below. 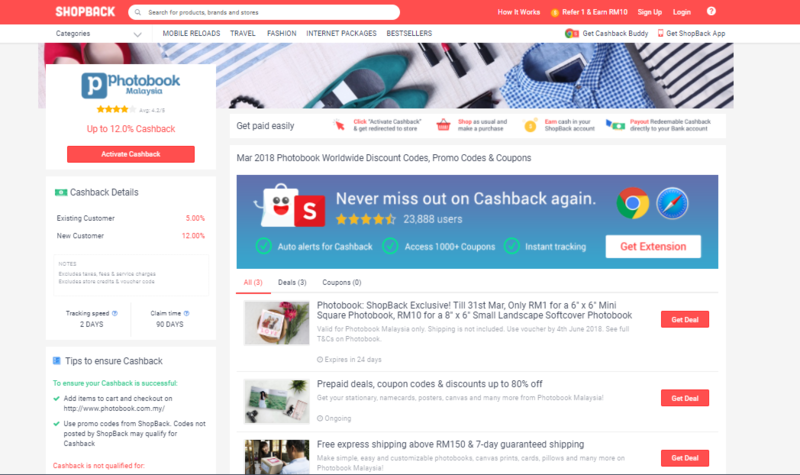 Discount offers Up to 12% Cashback Enjoy up to 80% off with prepaid deals, coupon codes & discounts on stationery, name cards, posters, canvas and many more from Photobook Malaysia. 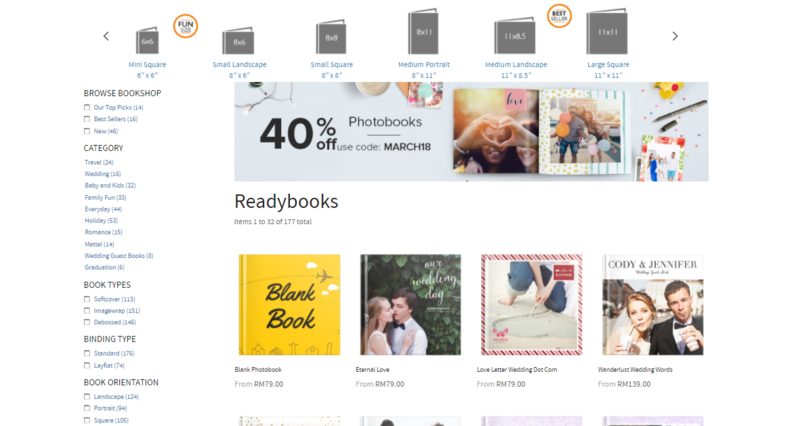 Free shipping Up to 12% Cashback Free express shipping above RM150 & 7-day guaranteed shipping Make simple, easy and customizable photobooks, canvas prints, cards, pillows and many more on Photobook Malaysia. Photobook Worldwide is a pioneer e-commerce business that offers customers a unique way of preserving all their precious memories through a fully customizable, premium printed photo album. This company focuses on creating beautiful and exquisite handmade photo books that one can easily personalize. Customers can personalize and document their favourite memories or occasions easily with Photobook Worldwide. From wedding albums, engagement books, family vacations, to personal portfolios and corporate books, one can always count on products of superior bookstore-quality printing and professional binding that comes in a handful of sizes. The easy and intuitive bookmaking software, Photobook Designer, makes it easy for customers to design their own book with a collection of ready-made book templates for various themes and occasions. Photobook Worldwide began its journey in Malaysia in 2005 when founder Mark Koay had an idea of providing a new way to develop interesting photo products for keepsake or as gifts. An expanding product range consisting of various photo gifts and prints soon saw this company gain popularity not just in its hometown in Malaysia, but across the globe as well. Innovative ideas such as canvas prints, greeting cards and photo prints among many others along with superior craftsmanship and lifelong quality have made this company a trusted name for preserving memories. The Photobook Worldwide Group currently serves more than 100 countries worldwide and has 4 global offices located in Australia, Canada, Malaysia and Philippines. Founder and CEO, Mark aims to further grow the B2B segment of the business and is currently heading the technology and Manufacturing divisions. With this innovative website, you can chronicle your most meaningful moments into timeless memories in premium quality Photo Albums and Photo Products. Featuring a wide range of Photo Book types, paper selections, covers, and accessories, along with several hundred-readymade inspired and often free designs, there’s something for everybody of all ages and for any event. Here we bring you a preview of the products available on Photobook Worldwide. Step 1: Select your preferred book size from the drop-down list. Choose from a range of book sizes and styles consisting of a hardcover or softcover photobook. Some of the popular styles include a hardcover photobook, landscape softcover photobook, small square photobook, among others. Next, name your new book project and click "Create". Step 2: Load your pictures by clicking on the "+" icon to your project. Select the pictures you desire to put into your book. Your photos will then be loaded into the "Pictures" tray, and are now ready to use. You are able to import pictures from Facebook and Flickr as well. Step 3: To insert a photo, drag-and-drop your picture into the page. You can choose to have your picture as a single picture, background picture or spread. Step 4: Use the following options to edit your pictures. Cropping - Drag the side handle inward to crop your picture. Rotating - Click on the Position button on the photo tools menu on the right of Photobook Designer. Toggle the picture according to your desired angle. Predefined layouts - Select the layout of your choice and simply drag and drop them to shape the entire page with your images. Step 5: Style your photos for a special touch. You can opt for stylish Black & White or Sepia filters. In addition, you can explore the image enhancements such as Contrast, Sharpen, Skin Tone, and Noise Reduction to showcase new results from your original images. Step 6: Change page styles, masks, backgrounds by designing each page with "Page Styles". Just drag and drop your preferred layout to the page. You can adjust and modify the page layout according to your preferred picture sizes. You can add a mask to a picture box or shape simply by dragging it from the library onto the picture. A mask will always scale to fit the box exactly. You can also use either your pictures as backgrounds, or the various pre-loaded background designs from the "Backgrounds" tray in the library. Step 7: Adding text or captions to your book and give special detail to your story. Photobook Designer automatically loads all font types available in your hard disk. You can choose the desired font sizes and colours. Step 8: If you happen to change your mind on the product size, or had made a mistake selecting the wrong size, simply change it using the "Change Product" icon. Select the respective book type, click "Change". Here you can choose a standard hardcover photobook or square softcover option. In addition, you can also change from a small landscape to a medium landscape or medium portrait based on the selected style. Step 9: Once you have finished designing your book, click on the green "Shopping Cart" icon to submit your photo book. Tick the disclaimer check box and click the 'Start' button. A new browser window will launch and you will be directed to Photobook Worldwide's online order page. Sign in or create a new account. Step 10: Confirm your details and make the payment. In case you have any promo codes or vouchers, fill in the code in the box and click 'REDEEM'. Click 'Confirm Order' and complete payment process. You will receive an email confirmation containing your order number (Example: PBO0138371) together with your order details. Step 11: Upload your order. Note that the order is not complete until your book has been uploaded. Once you have completed the online order form, upload your book by choosing "UPLOAD ORDER". You may choose to upload files online (approximately 30-45 mins depending on internet stability and file size), or save into a portable storage media (CD or thumb drive) and come to the Photobook office to submit it. Click 'Continue'. Your order is complete once your file has been uploaded successfully. For residents in Malaysia, payment via cheques and internet banking/bank deposit is also available but the processing time of the order may take longer till the funds to clear. Step 1: Visit the ShopBack website and click on the Photobook Worldwide store at the bottom of the homepage. You can also use the search box to find the link to the merchant store. Step 3: If you are interested in finding latest coupons, check out the Promo codes, coupon codes, vouchers and discount codes section. Step 4: You will be redirected to the Photobook Malaysia website to browse and select the items. All orders are dispatched via courier or designated shipping provider, and are determined by their respective delivery schedules. Additional delivery time may be required during peak seasons and special occasions due to high demand. Customers can choose from the following shipping options to determine their delivery time frame. Express Shipping: Express Shipping is an express courier delivery service with tracking. Average delivery timeframe will take between 4 to 6 business days (depending on location and subject to peak season). Not deliverable to PO Boxes. Priority Shipping: Priority Shipping is an express courier delivery service with tracking. Average delivery timeframe will take between 3 to 5 business days (depending on location and subject to peak season). Not deliverable to PO Boxes. Free Shipping: Free Shipping is an option that will be available for orders above RM150, and is not applicable for all Canvas Prints, Clocks, Framed Prints and Metal Prints orders. The amount valid is the final sum of after any promotion/voucher code applied and does not include the amount paid for the voucher. Waiting for Files: Only applicable on orders from Photobook Designer Software. This status implies that your order has been received but is still pending upload of the files. Email containing steps to re-upload will be sent to you should you not upload within 24 hours of payment. If you have not received it, be sure to check your Spam Inbox regularly. In Production: Your files have been received and is currently being produced. This process may take between 2-3 working days and will go through several Quality Control stages before it is finally shipped. Shipped: Your book has been shipped. An email containing your shipping and tracking details will be sent to you. Tracking ID and URL is only available for Express Shipping. Not applicable for Standard Shipping (if available in your country of residence). Error: Please contact Customer Support with your order number. Null: The email/order number that you have inserted is incorrect, please try again. In case you need any help, you can fill the support form by clicking on the tab at the bottom of the page and send it to the customer care team. In addition, the company also has the following communication channels for customers to reach them. The team can be reached Mondays to Fridays, from 9am to 6pm and Saturdays from 9am to 1pm, except on Public Holidays.